Gloucester beat Sale Sharks 11-12 to give them their first Aviva Premiership loss at their home venue the AJ Bell Stadium this season. 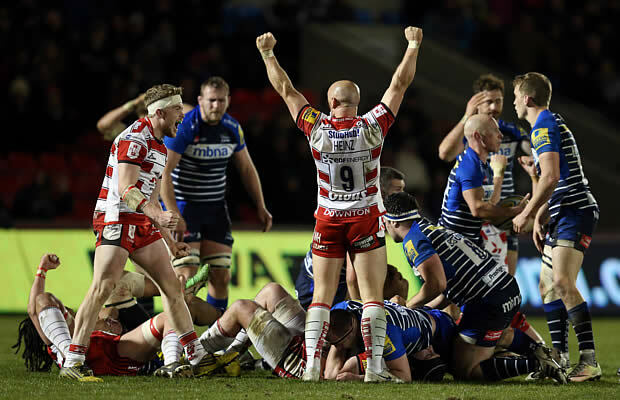 Gloucester’s victory is also a blow for Sale Sharks hopes of finishing in the Premiership’s top six teams. Sale Sharks scored on the only try of the match but Greig Laidlaw’s four penalties proved to be enough in Danny Cipriani’s last home match for Sale. Sale went into this game knowing a win would keep their hopes of a Champions Cup place alive. But, it was Gloucester who opened the scoring from the ever reliable boot of Laidlaw, who started at fly-half for the Cherry and Whites in the absence of James Hook. On his final home game in front of the Sale fans, Cipriani opened his account for the evening from the tee. The battle of the boot in the first half continued with Laidlaw re-establishing Gloucester’s three point lead on the half hour mark. 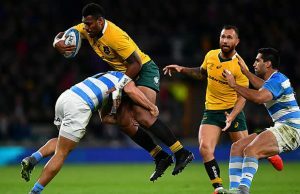 However, with the last kick of the first half, Cipriani levelled the scores with another penalty of his own taking the score to 6-6 as the players headed into the changing rooms. After a scoreless 15 minutes, Sale scored the first try of the game on 55 minutes through Leota after 16 phases of play from the home side. A third penalty from Laidlaw reduced Sale’s lead to ten points as the game entered the final ten minutes. With 3 minutes to go, Laidlaw kicked is fourth penalty to give Gloucester a 12-11 lead. 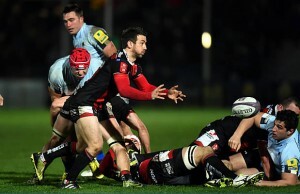 Sale piled on the pressure in the closing moments but failed to break the visitors’ defence. The win means Gloucester join Montpellier as the only other side to come away from the AJ Bell Stadium with a win this season. Referee :Tom Foley (19th Premiership game). Assistant Referees: Ross Campbell & Simon McConnell.